One of the world’s most iconic stadiums with some of the best atmosphere on the right night. Feyenoord is looking to build a new stadium so make sure to pay De Kuip a visit while it lasts. De Kuip, officially called Stadion Feijenoord, was built in the 1930s to provide Feyenoord with a new world-class stadium. Inspiration for the new stadium came from then club-president Van Zandvliet, whose ambitions for the club involved a new 65,000-stadium. While many doubted the viability of his plans, the Rotterdam city council voted in favour and two architects were sent on study trip around Europe. They returned particularly inspired by the newly constructed double-decker stand at Highbury. 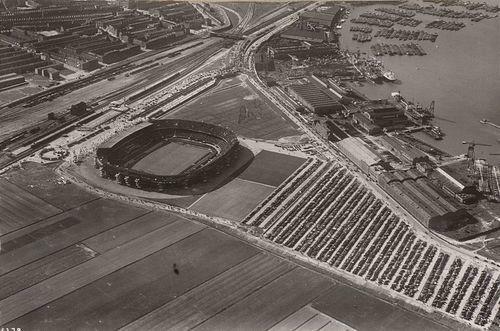 Construction of De Kuip, Dutch for tub or bowl, started in 1935 and finished only 10 months later. 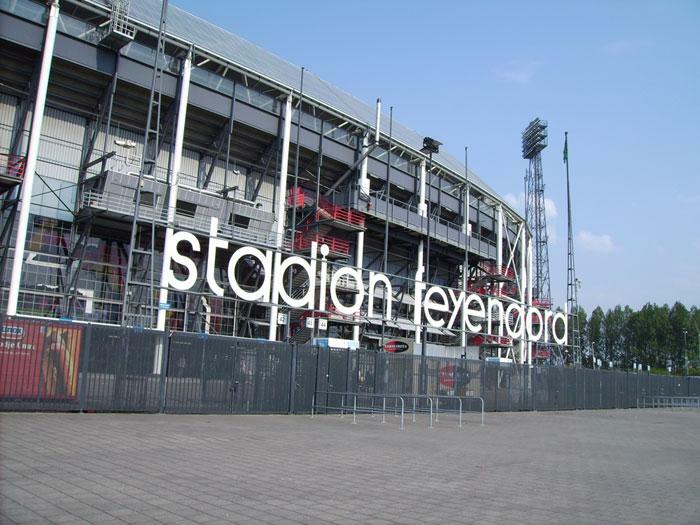 The stadium was ready in July 1936, however the Rotterdam government had failed to upgrade the infrastructure around the stadium and a first match had to get postponed. Half a year later, on the 27th of March 1937, De Kuip finally opened with a match between Feyenoord and Belgian side Beerschot (5-2). A month later the Dutch national team played its first international at the stadium against Belgium. 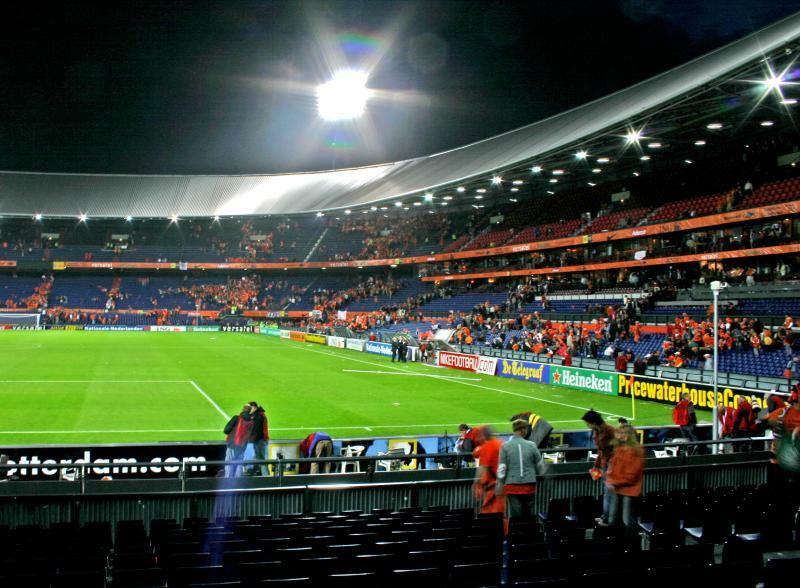 In the next decades, De Kuip turned into one of the prime venues of Europe and hosted various European cup finals. The first was the final of the Cup Winners’ Cup in 1963 between Tottenham and Atlético Madrid, the second another Cup Winners’ Cup final in 1968 between Milan and Hamburg, followed by the 1972 European Cup final between Ajax and Inter (2-0), and another Cup Winners’Cup final in 1974, this time between Magdeburg and Milan. In the 1980s, De Kuip hosted the 1982 European Cup final between Aston Villa and Bayern (1-0), and the 1985 Cup Winners’ Cup final between Everton and Rapid Wien. A fifth and sixth Cup Winners’ Cup final were hosted in 1991 and 1997, the first between Manchester United and Barcelona, and the second between Barcelona and Paris Saint-Germain. In 2002, the final of the UEFA Cup was played at De Kuip, which saw home side Feyenoord beat Borussia Dortmund 3-2. 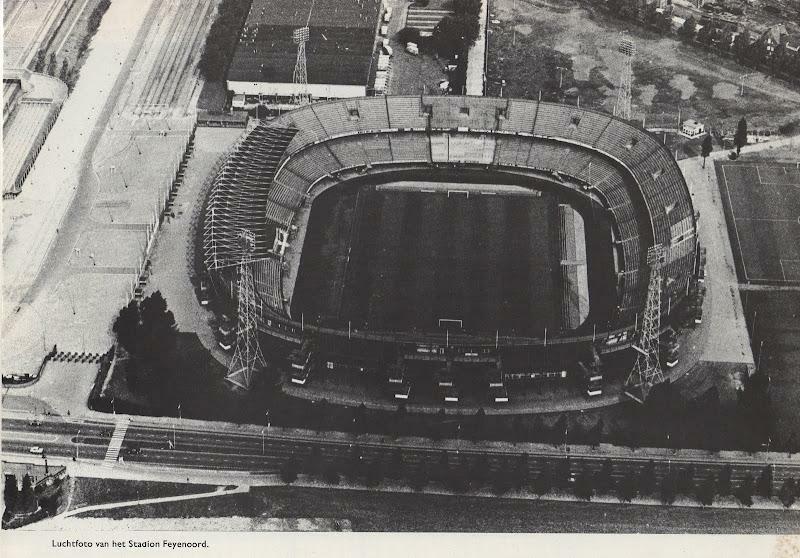 By then, De Kuip had already undergone an extensive redevelopment. 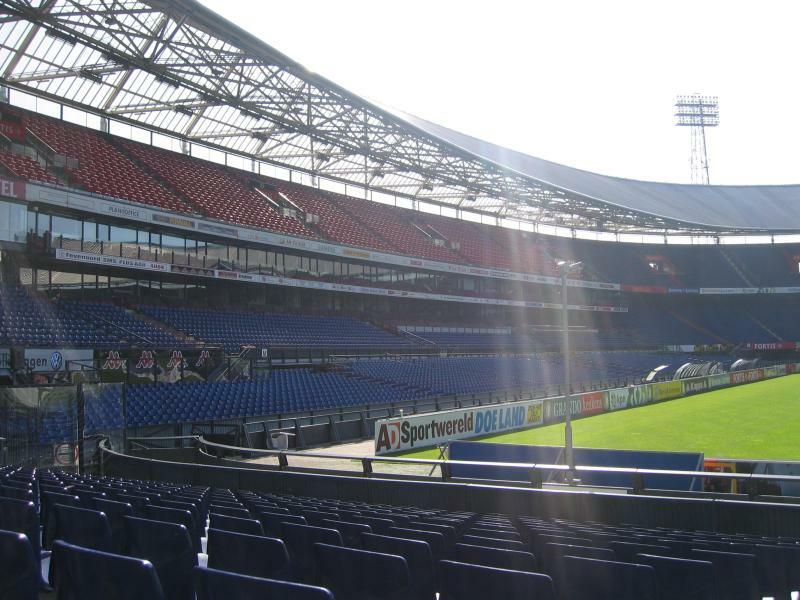 In the early 1990s, the state of De Kuip had deteriorated to the extent that it could hardly meet safety requirements, and works included a thorough refurbishment of the stands, the creation of new corporate facilities, and the installation of a roof over the previously uncovered stands. 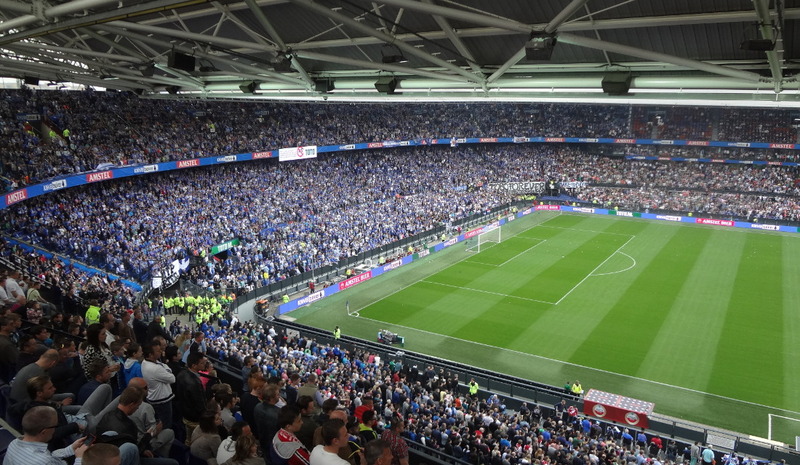 De Kuip was chosen to host the final of the Euro 2000 championships, receiving preference over the newer and slightly bigger Amsterdam ArenA. 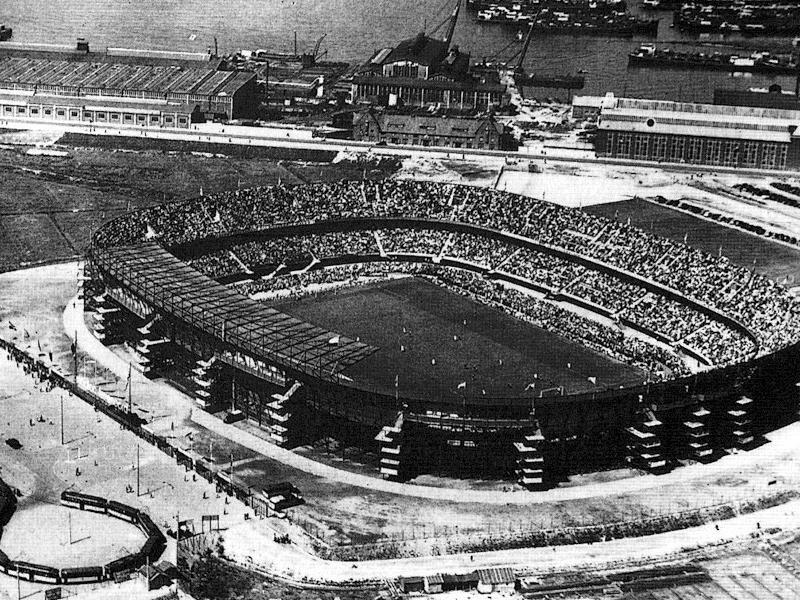 During the tournament, the stadium hosted three group matches, the quarter-final between Holland and Yugoslavia (6-1), and the final between France and Italy (2-1). Feyenoord have long been contemplating either renovating De Kuip or building a completely new stadium. 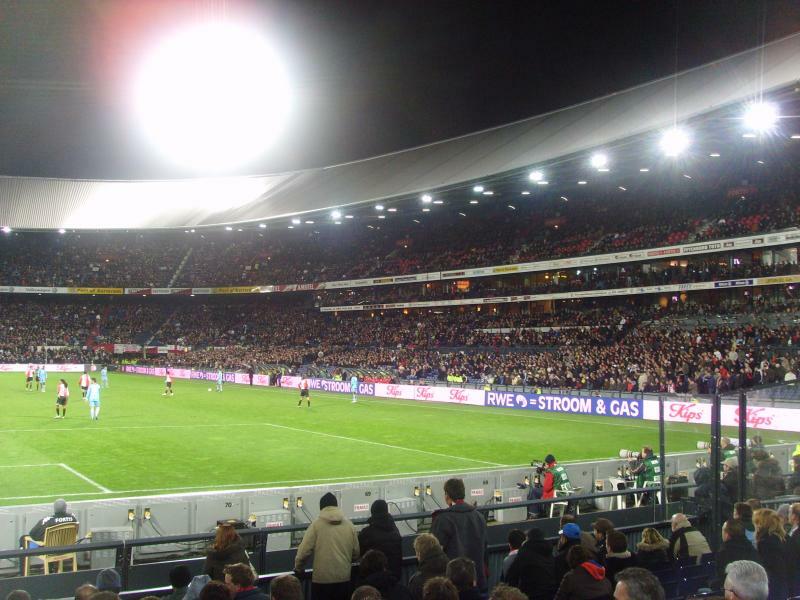 The decision finally fell in favour of building a new 63,000-seater stadium next to De Kuip, though the club still needs to obtain planning permission and arrange funding, and realisation is therefore far from guaranteed. De Kuip is located on the south bank of the river Meuse, just a few hundred metres away from the river, but about 4.5 kilometres from Rotterdam’s city centre and more than 5.5 kilometres from the central rail station. If coming by car, the stadium is best reached from the A16 motorway. Take exit 24 Feijenoord (if coming from the north the first after the Van Brienenoord bridge). Follow the Stadionweg west until reaching the stadium. If using public transport, take tram 23 from Rotterdam’s central rail station. After a 20-minute journey get off at stop Stadion Feijenoord. On matchdays one can also take tram 29. An alternative is taking a train to rail station Lombardijen, also on the south bank, and continue with tram 2 in the direction of Charlois. After a 6-minute journey get off at either station Beukendaal or Breeplein. The stadium is a further 10-minute walk away. Both trams run at least once every 10 minutes. On matchdays it is also possible to catch a train from Rotterdam Central Station (or Dordrecht) to station Stadion Feijenoord, which lies adjacent to the stadium. On non-matchdays there is no train service to this station. De Kuip is part of a larger sports complex that includes the club’s youth academy. The stadium lies in a predominantly residential area, and in particular the area across the railway tracks rates among the poorest of Rotterdam. The area on the banks of the river Meuse has recently been redeveloped though, and boast a cinema, some eating options, and the odd bar. Still, eating and drinking can best be done in Rotterdam’s city centre, from where it is a short public transport ride to the stadium. The area around Stadhuisplein is a good start for drinking, though Rotterdam nightlife is rather dispersed over the central areas. There are no hotels located in the immediate vicinity of De Kuip. The closest hotels are in the Kop of Zuid area on the renovated and edgy south bank, from where one can walk to the stadium in about half an hour. Otherwise, there is a good few options in Rotterdam’s centre. Tickets for Feyenoord matches can be bought online, or at the Service & Tickets booths at De Kuip. If tickets remain available, these can also be bought on the gate from 3.5 hours before kick-off, however Feyenoord tends to sell out most league games so booking in advance is strongly recommended. Feyenoord require possession of a Feyenoord Club Card to be able to buy tickets for a certain number of matches that have a high risk for fan violence, typically about 7 per season. Tickets prices range from €23.50 for a lower-tier seat directly behind the goal to €48.50 for a central seat at the long sides. For more information call +31 (0) 900 1908. De Kuip organises guided stadium tours that include the players tunnel, VIP areas, and the Feyenoord Museum. The tour lasts about 90 minutes. Tours typically run Wednesdays to Saturdays and occasionally Mondays and Tuesdays two or three days a week: at 10:30 am, 12:30 pm and 2:30 pm. Tours are limited to a certain number of participants so booking is recommended, especially during school holidays. Bookings can be made online. The tour costs €13.50. Feyenoord.nl – Official website of Feyenoord Rotterdam. Dekuip.nl – Official website of De Kuip. Rotterdam.info – Website of the Rotterdam tourist board. RET.nl – Rotterdam public transport information.